Summary: The acclaimed author of The Space Between Us and The Weight of Heaven returns with a breathtaking, skillfully wrought story of four women and the unbreakable ties they share. In the course of their journey to reconnect, Armaiti, Laleh, Kavita, and Nishta must confront the truths of their lives—acknowledge long-held regrets, face painful secrets and hidden desires, and reconcile their idealistic past and their compromised present. And they will have to decide what matters most, a choice that may just help them reclaim the extraordinary world they once found. 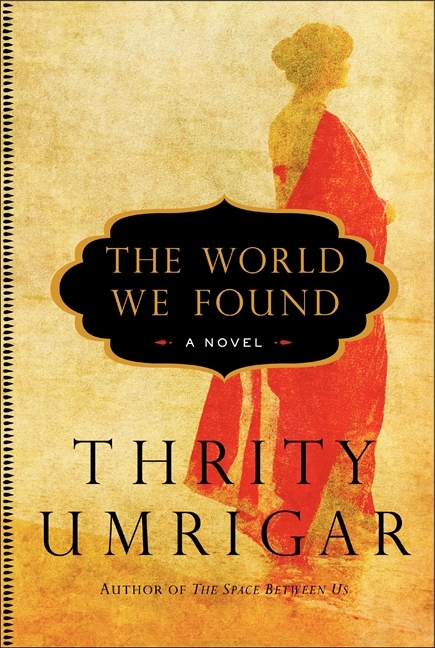 THE WORLD WE FOUND by Thrity Umrigar is one of those books that I've picked up a number of times just because I was so excited to read it. I think Ms. Umrigar is just a remarkable writer and I'm pretty much guaranteed to love her books. And then, I'd sit down to read it and see that it wasn't being released until 2012, and I'd put it down for a later date. I must have done this two or three separate times. You'd think I would have just read it and written my review earlier, but that didn't even dawn on me! I have been processing this novel for a few days because I didn't want to jump right into my review; however, I have to be honest when I say that I'm still reeling from this book. I am all over the place with the characters and their actions, and I'm still trying to organize my thoughts. Rather than try to articulate what I'm feeling in words, I just wish I could discuss this novel with my friends. It would make the perfect book club book, but more on that later. I'm not sure what I loved more about THE WORLD WE FOUND -- the story or the writing. Both were outstanding in my opinion. I think because I always enjoy Ms. Umrigar's characters and their stories so much, I tend to get caught up in the book and forget just what an amazing writer she is. Her prose is beautiful and her dialogue seems so authentic to me. As I read this novel, I felt as if I was right there in India with her characters. In addition, I have to give the author major credit for balancing the four different female characters in this novel. Each one of the women came to life to me with their own distinct personality and voice. Despite my appreciation of the story and the writing, I think I appreciated just how much THE WORLD WE FOUND make me think. At its surface, this novel was about female friendships and I was touched by the strength of these four women. I absolutely treasured the relationships these women had and was even envious of the extent these women would go for each other. And I also deeply appreciated how this book explored the other relationships in their lives -- from their husbands, to their relatives, to their children. However, this novel also explored so many other thought-provoking issues including religion and politics. I thought these subjects were presented in an extremely interesting way; and I can't stop thinking about the complexities of these issues especially as they relate to India and its people. I have always been fascinated by anything having to do with this country, and I can't express how much the lives of these four women have affected me. I apologize that this review is both gushing and unorganized at the same, but I think it just might be the best way for me to express just how much THE WORLD WE FOUND affected me. I highly recommend this book to... pretty much anyone! This sounds wonderful! I've wanted to try this author for a long time - sounds like I should get to it! I have to get my hands on this book! I have been admiring it from afar and your review just told me everything I needed to do to decide if it was for me. I actually picked this up at SIBA this past year, I just NEED TO READ IT. Which is the story of my life. After your review, and Swapna's, I am going to try very hard to make it a priority. I've only read one Umrigar book and I thought it was fantastic, so I'm not surprised to see you gushing over this one. I can't wait to read it. Wonderful review, Julie! Swapna raved about it too. I've put this book at the top of my list. Oh I could tell you really liked this book. Going to go pick it up today! I have seen a few great reviews for this book in the past day. I have a copy so I will have to make sure I get to it soon. I have never read this author but this review tells me she is one to look out for, so I have added this to my list of books to check out. I've never read Umrigar, even though she's local. Next week I'm headed to her book signing for this book and now you've gotten me all excited :) Thanks!